Signs of Sino-Japanese Détente Despite New US-Japan Defense Guidelines? Both sides seem to be trying to defuse tensions, if not actually addressing the underlying causes. “The Japan-US alliance is the linchpin of Japan’s diplomacy and security and a public good for not only the Asia-Pacific Region but also the international community.” This statement is from the Japanese Ministry of Foreign Affairs on its official website. Japan has traditionally placed a premium on close ties with Washington in matters of national defense. In this spirit and cognizant of the volatile security environment of East Asia, the United States and Japan are currently working on revising defense plans for the first time since 1997. In October 2014, the U.S. Department of Defense published an Interim Report on the Revision of the U.S.-Japan Guidelines for Defense Cooperation outlining new threats and Japan’s increased role in the alliance. The revised Guidelines will detail cooperation between the two governments in situations involving an armed attack against Japan, and in case of an armed attack against a country that is in close relationship with Japan where Japan’s use of force is permitted under its Constitution and in accordance with the Cabinet decision by the Government of Japan on July 1, 2014. Although not explicitly naming China, it is clear that the People’s Republic and its perceived regional expansionist ambitions underlies the principle reason for the revision of the guidelines. In July of this year and the first time since 1947, the Japanese government led by Prime Minister Shinzo Abe moved forward with a reinterpretation of Japan’s constitution (Article 9) allowing the Japanese military to defend the United States and other allies in times of conflict. Despite some limiting stipulations (e.g., Japan’s survival must clearly be at risk) on the exercise of collective self-defense, the constitutional reinterpretation is a watershed event in Japanese post-1945 defense policy. The United States and Japan are continuously stepping up their military cooperation. In November of this year, the United States and Japan will be holding a biannual bilateral military exercise (“Keen Sword”) involving around 10,000 US troops and 30,700 of their Japanese counterparts. Also, as part of its pivot to Asia, the US Navy will station three additional ballistic-missile-defense (BMD) capable destroyers in Japanese ports. Japan itself is planning to double the number of BMD destroyers by 2018. New submarines as well as new helicopter carriers supplement the picture of a resurgent Japanese military. However, the new U.S.-Japan defense guidelines, Japan’s reinterpretation of its constitution, as well as the acquisition of new military hardware by Tokyo should not be seen as a signs of a preordained immediate escalation of tensions in East Asia. For once, substantial security reforms in Japan still face numerous obstacles as the East West Center report points out. In addition, it has become increasingly clear that both the People’s Republic of China and Japan are interested in some form of political détente. Chinese President Xi Jinping and Prime Minister Shinzo Abe met informally during the 2014 APEC summit this November. The Japanese side especially made efforts to secure this meeting and, according to some media reports, Shinzo Abe has even acknowledged that Japan’s claim to the contested Senkaku islands is “disputed.” De-escalation appears not to be the sole domain of politicians. A chapter of an influential Japanese group representing families of soldiers killed during World War II has passed a resolution for the symbolic removal of 14 war criminals from the controversial Yasakuni shrine, the official visit by Japanese politicians that has repeatedly incited anti-Japanese protests in China. On the Chinese side, there are also signals that Beijing is trying to defuse tensions rather than fuel them. In September 2014, China and Japan agreed to revive talks on a maritime crisis hotline. An informal Sino-Japanese Track II dialogue in October 2014 has re-emphasized the need for better communication between the two countries. A senior Chinese politburo member also announced to a Japanese business delegation that he wished to resume an official economic dialogue at the ministerial level, which was suspended since 2010. Apart from Japan, China has also tried to defuse tensions with Vietnam and India, by withdrawing a contested oil-drilling platform in the South China Sea, which had sparked violent protest in the former, and agreed to regular meetings and a military hotline with the latter after serious border disputes. According to my colleague Greg Austin, “A picture is emerging of China seeking to defuse flare-ups, even if it does little to resolve the underlying conflicts.” Shinzo Abe is also doing very little to resolve the underlying disputes. 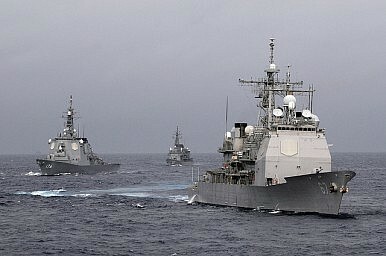 Unless some of the fundamental problems in the bilateral relationship are tackled (e.g., the unresolved wartime history between both nations), there will always be the danger of a quick escalations of hostilities between China and Japan inevitably – as stipulated in the soon to be updated U.S.-Japan defense guidelines – drawing in the United States. Franz-Stefan Gady is a Senior Fellow at the EastWest Institute. This article was originally published at ChinaUSFocus.com. It is reprinted with kind permission. The 71st anniversary of Japan's surrender saw several officials visit Yasukuni Shrine, although PM Abe did not.